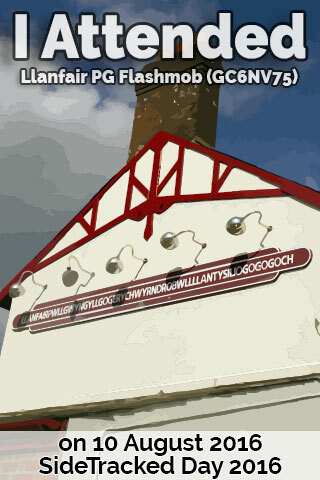 The SideTracked Llanfair PG Flashmob badge has been revealed! To be eligible to proudly display this badge on your profile, attend the Llanfair PG Flashmob on Wednesday 10 August 2016. You'll not get this automatically from Groundspeak or Geocaching.com, to obtain the award, simply copy and paste the HTML code to the right into your geocaching.com profile. You can copy and paste the code by looking to the right of this page, underneath the Souvenir image.